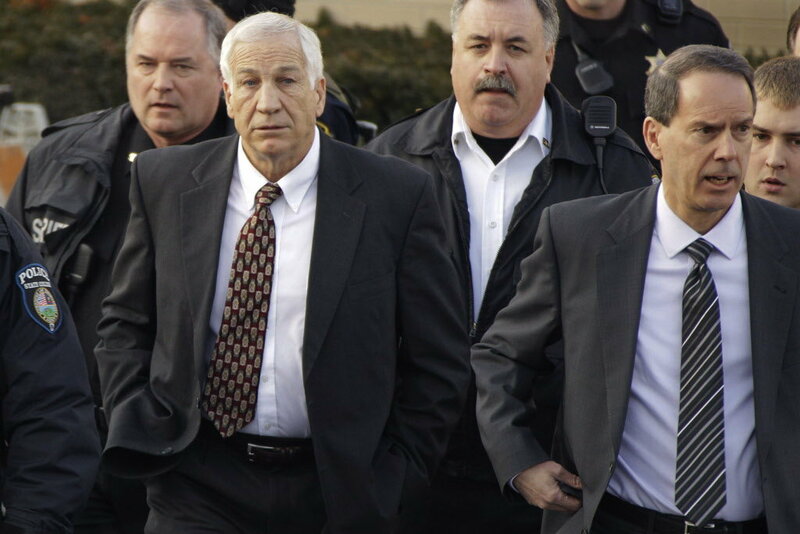 Former Penn State football coach Jerry Sandusky (left) and his attorney Joe Amendola enter the courthouse on Dec. 13. Lee Davis, a friend of The Legal Blitz, and all-star defense attorney at Davis & Hoss, PC in Chattanooga, took the time to share his thoughts about the pros and cons of Jerry Sandusky waiving his preliminary hearing last week. Sandusky pleaded not guilty to 52 charges of sexual assault. Davis, a Boston University School of Law graduate and National Criminal Defense College attendee, is a former Assistant District Attorney that now specializes in criminal defense. He shared the following from his blog, Athletes In Court. I think that to evaluate the decision to waive the preliminary hearing requires that we understand the motivations involved. Sandusky is evidently not rational in his decisions. How can he explain the Bob Costas interview or other statements to the press? Those are the equivalent of legal suicide. From the interview with Costas alone, Sandusky is now on record placing himself in a shower, naked, with a boy, touching his leg and corroborating all aspects of the felony charge except the sexual act. The actual taped interview is admissible as a statement by Sandusky. In it he has admitted virtually all essential elements to the crime charged, save the sexual contact. The victim will fill in that detail with live testimony at trial. So, both the defense and the prosecution know that Sandusky cannot survive a trial. He will be convicted. Knowing that, Attorney Amendola has very little to gain by putting the victims through a preliminary hearing. The hearing will only galvanize hatred toward Sandusky. Amendola is correct in his estimation that a judge would not allow him to cross examine the victims very far about these allegations. The judge brought specially in from Western Pennsylvania is not going to allow Sandusky’s lawyer a fishing expedition into the lives or behavior of these victims. A preliminary hearing might sound like a good idea, but in practicality it will net the defense little. By passing on the preliminary hearing, Amendola is signaling that he is not attempting to embarrass the victims or intimidate. He may be in negotiations with the District Attorney’s office about a plea, but I suspect it is still too early for earnest discussions about a guilty plea. And, Sandusky is probably too far removed from reality to accept a guilty plea. Any contemplated plea at this point will be the equivalent of life in prison. The District Attorney has no need to rush this matter, and only over time can Amendola expect Sandusky’s prospects to improve. Amendola is attempting to hold together credibility with the prosecution. Only by keeping a line of communication open will he be able to discuss resolution of the many crimes that make up the Sandusky prosecution. Humiliating Sandusky’s victims with a public display in court today would not have advanced that cause.